1) This article has been presented for the first time at the South East Survey Congress in Bandar Seri Begawan, Brunei Darussalam, 21-25 November 2005. It is published as the Article of the Month to show respect to the memory of the victims of the Tsunami disaster in December 2005. 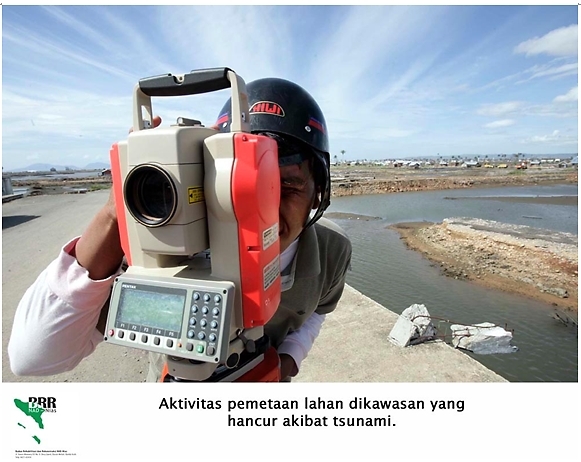 Tsunami and earthquake in 26th December 2004 in Aceh, the northern part of Sumatra Island, have significantly given valuable lessons for all kind of human living; include the relationship between land and people, which is the domain of cadastral services. One of the precious lessons is that the cadastral mind-set needs to be reformatted in line with the new movement to be more focus to the people rather than to the land or to the right attached on the land. The increased role of people as one of the stakeholders needs to be restructured since the Community has the power to be the central of information provider. Cadastral systems always deal with “who own what, where and area”. The phrase of “own what, where and area” has successfully been carried out through legal and geomatics components, leaving the phrase “who” survive. In general, if the principal of the deep-rooted of cadastral systems world-wide constantly leaving the power of people remained intact disregard, than the issues of cadastral problem-solving are vulnerable. 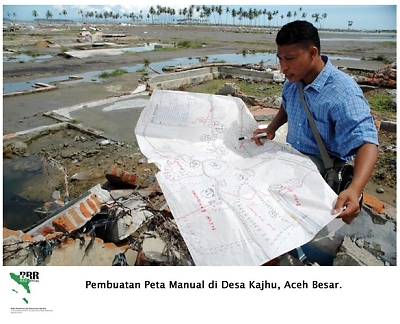 Post Disaster in Aceh reinforces the importance of having integrated awareness from all stakeholders regarding the challenges and issues involved in exercising cadastral services. As a result, a newborn concept of a Community-Driven Adjudication (CDA) is innovated in undertaking cadastral reconstruction. The objective of this paper is to promote a better understanding of the nature of a newborn thought of cadastral approach. It is hoped that the paper makes a worthwhile contribution to the growing world of knowledge and sciences. Insya ALLAH. The 26 December 2004 earthquake and tsunami in Northern Sumatra has had a damaging impact on the province of Nanggroe Aceh Darussalam (NAD) or Aceh (see Photo1). 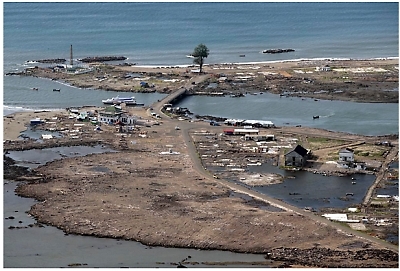 The situation was exacerbated by the March 28th 2005 earthquake which had a significant impact on the Nias Island. Much of the region's coastal infrastructure, housing, and record systems have been lost including land records, along with more than 130,000 lives. Approximately 300,000 land parcels were entirely affected by the disaster (160,000 urban, 140,000 rural). The physical presence and evidence of ownership for many of these parcels of land property have totally been lost. About 90,000 certificates of title were damaged by the Tsunami. The contribution of cadastral reconstruction to the redevelopment of the affected areas post disaster is evident at all levels and sectors. However, exercising the cadastral reconstruction in these areas is far beyond simple due to the shortage of survived land-owners and of information related to each land parcel. The main difficulties of cadastral reconstruction is facing are directly related to the community need for re-establishing land boundaries, to accomplish reliability of spatial and juridical data on every damaged land property. Theoretically, cadastral reconstruction is relatively straightforward from the technical viewpoint particularly by utilizing modern technologies. In spite of this, in overwhelming the complexity situation and condition in the areas of post disaster is not simply the issue and the exercise of technology. Cadastral reconstruction deals with the very difficult situation due to the lack of resources. The extent of the damage and task facing reconstruction are of a magnitude unprecedented in recent natural disaster history. Piece of evidence regarding formal documents on land ownerships are hardly ever and piece of information becomes critical, due to the total destruction, while only few land owners have been staying alive. This is an extremely gigantic challenge for all professions, not only cadastral science. The level of difficulties in exercising cadastral reconstruction is remarkably superior that demands an absolutely integrated energy from all stakeholders. Awareness from all stakeholders of the challenges and issues involved in exercising cadastral reconstruction has enabled greater preparation prior to the steps of action being taken. The first step has been to discover the data availability through various resources, either from the remaining documents, satellite imageries and information provided by people. This has been the key driver for the development of cadastral reconstruction and the focus of development steps forward. The second step has been to identify key stakeholders involved in the exercise, such as: the survivors, informal village leaders, non government organizations, and private sector and government institutions. The integrated works of all stakeholders has been performed through local, national and international links to increase sharing and documentation of experience to facilitate implementation and face the complexity of decision-support challenges. One of the important consequences of the second step has therefore been the inclusion of people as the key stakeholder, alongside technical and institutional elements. In photo 2 the process of mapping in the village of Kajhu, Aceh Besar has shown the role of people as the key stakeholder. Considering the important and dynamic interaction between people and data required for developing more reliable and effective land records, it is important to take into account the changing nature of communities and their needs. In this situation, people recognize that cadastral reconstruction is all about facilitation and bringing together the reestablishment of land-people relationships which is fundamental for community needs. Stakeholders recognize that societal issues are critical factors in determining the success of cadastral reconstruction. Therefore, the main important resource is the information flow provided by people to be integrated into the available data and remaining documents. The role of information provided by the people becomes the key string in exercising cadastral reconstruction. Photo 2. Mapping in the village of Kajhu, Aceh Besar. It is figured that about 300,000 land parcels have in a straight line been affected by the disaster, of which only some 60,000 are officially documented. In the areas, where the devastation was relatively minor, the reconstructions of border lines amongst properties are to a certain extent uncomplicated. There are an adequate amount of survivor members who could give information of who lived where and owned what. The information compilation is slightly effortless. Nevertheless, even in this case, disputes may arise, caused by opportunistic land grabbers or due to uncertain inheritance rights when the parents have perished. It was reported that more or less 6,000 cases were filed in just three months. Moreover, in the case of lack of information sources and where former foundations of houses are deeply buried and where there are no traces of boundaries, restoring land rights is even more complex. Another problem would be resolving alternative sites for those who must move, either because their original land has simply been washed away or because the land is no longer safe for living. The consequence of damage to land property records and land management system is the major insecurity in land and property rights being felt by the people. After suffering huge economic and emotional losses from the tragedy, for many people, the land may be the only thing of value they have left. 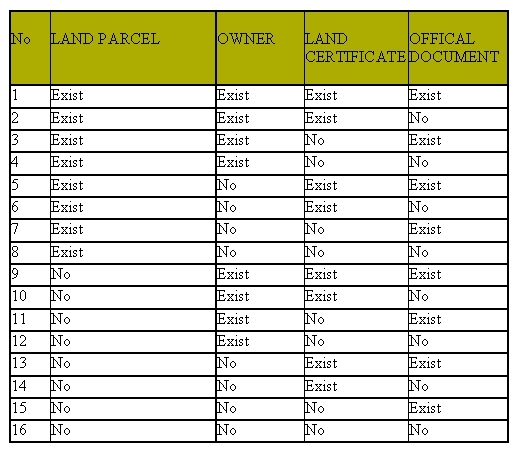 Conditions of land parcels post disaster have different characteristics which consist of sixteen combinations (see Table 1). Table 1. Land-Owner-Document Condition (Haroen et al, 2005). It is also puts on view the importance of recovery and protection of property rights that should be conducted straight away for the following reasons, namely recovering and protecting land property rights will lay a solid foundation for the reconstruction work, spatial planning, compensation, and long-term economic development. In addition, recovery and protection of land rights are essential for establishing social justice and ensuring a long-term social stability. Urgency of this matter is implied by the fact that as time passes, any damaged but remaining physical evidence of land ownership is likely to be destroyed in the general clean-up operations. Moreover, opportunists will begin to make unlawful claim over land holdings or rights of vulnerable and disadvantaged group. The most vulnerable groups are widows and children who often cannot effectively defend their rights and hence, their land could be more likely subjected to land grabbing. The damage caused to property rights is severe. A summary of the damage and its impact are: (i) Land Offices were severely damaged and documents were either damaged or lost, (ii) Land Books were flooded with sea water and mud that required immediate action for recovery; otherwise, these documents if not treated in the next couple of months, may be irretrievably damaged, (iii) Cadastral maps were destroyed. (iv) Only 25% of land in Aceh is titled. Some areas have lost all physical and human evidence of ownership. (v) There is no back up for Land Books nor the cadastral maps. It is understood that the shortage of reliable information on land properties needs to be overcome. It is absolutely required that cadastral reconstruction must be able to re-establish the acceptable locations of every land parcel in the area. However, it is uneasy mission that definitely requires an integrated channel of communication amongst all stakeholders: the Community, the Government and the NGO. The sound communication will drive a strong information integration which useable for the exercising of cadastral reconstruction in the affected areas. The application concept of re-engineering in this matter is unavoidable. Therefore, the Government has taken a broad-base strategy to encourage cooperation amongst stakeholders to assemble data sets provided by different resources integrated into the available data base. 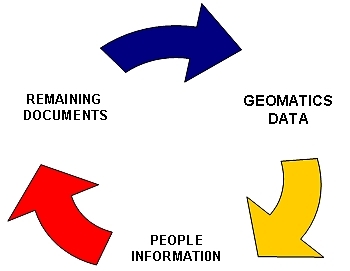 The cooperation deals with the remaining documents in the Government offices, geomatics data supplied by NGO and together with the Government, and verbal information gathered from the community (see Diagram1). The strategy development requires coordination, cooperation and awareness across different resources. As a result of some of the difficulties in exercising cadastral reconstruction, BPN as a National Land Agency started to develop a strategy to remodel adjudication for the community, which is called CDA or Community Driven Adjudication. It is the needs of the user community that drive a CDA. Adjudication, as the process where an existing right on land is conclusively and authoritatively ascertained, is a prerequisite to legitimately be registered in order to build a juridical relationships between people and their own land property. Nevertheless, despite the expectation, cadastral reconstruction through the implementation of a modernized adjudication is forcefully dependent on increased awareness of the people regarding the information flow on land matters. This new strategy appears to show that cadastral model is moving from a techno-centric to a socio-technical model of cadastral development in order to neutralize difficulties arising from existing model. This has set in motion the delivering of a newborn concept of cadastral model to be more community driven. Raising awareness of the community as a whole regarding the importance of the people role by creating a comprehensive forum for the community needs to discuss their problematic issues. Promoting the development of well-built cadastral data base by improving the cadastral data infrastructure. By observing the above strategic objectives, it is clear that it is the time to introduce a new mind-set of cadastral systems. The increased role of people as one of the stakeholders needs to be rationalized since the Community has the supremacy to be the central of information provider. 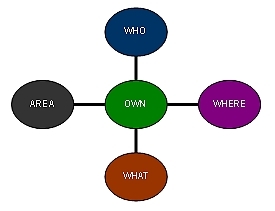 Cadastral systems always deal with “who own what, where and area” (see Diagram 2). The phrase of “own what, where and area” has successfully been carried out through legal and geomatics components, leaving the phrase “who” survive. The focus of the project, which has commenced in July 2005, is the progress of community driven adjudication (CDA) (or Community Based Mapping) for the resolution of land ownership rights, land boundaries and inheritance reached through obtaining community agreement. To ensure consistency of approach to CDA across the multiple agencies involved in Community based Mapping, CDA guidelines have been prepared through a collaborative effort involving Government, NGOs and donors. Strengthening community institutions and decision-making processes with special attention to the rights of women, children and orphans. RALAS reported that prior to the fasting month of Ramadhan up to 25,000 land parcels have completed community land mapping. This represents about 60 villages in Banda Aceh, 20 villages in Aceh Besar and 20 villages in other districts in Aceh. In August 2005, BPN deployed its RALAS Project Implementation Unit (PIU) to Aceh and by early September had deployed 200 personnel (10 adjudication teams). In early October, these teams were deployed to the field to start officially surveying and adjudicating completed community land mapping (Photo 3). In close cooperation with relevant stakeholders, the Manual for Community Driven Adjudication (CDA) was completed on June 10, 2005. This manual has been issued by BPN as a decree. BRR or Badan Rehabilitasi dan Rekonstruksi (Rehabilitation and Reconstruction Agency) has also prescribed the CDA Manual as a standard for reconstruction. It is now being used by all trained facilitators supporting shelter projects as the standard for community land mapping. At least 600 facilitators have already been CDA trained. UNDP has committed to training almost 750 facilitators. According to BPN it can be expected that on October 26, BPN will issue Public Notification for the first 1,500 land parcels in Banda Aceh (1000) and Aceh Besar (500). Providing there are no objections, land titles for these parcels will be available for distribution to beneficiaries in about 6 weeks (30 days for public notification and 2 weeks for documentation preparation). It is planned that the titles could be distributed on December 20, 2005, subject to the issuance of the Government Regulation to waiver land registration taxes, fees and charges. By December 31, 2005 RALAS expects that up to 30,000 parcels of land will have completed community land mapping. Currently, adjudication teams are ill-equipped. If additional equipment becomes available soon, BPN anticipates a maximum of 12,000 land parcels will have land titles ready for distribution by December 26. If equipment is further delayed, a maximum of only 7,500 land titles can be expected for distribution. Up to 600 personnel have been trained in CDA, comprising of 400 NGO land mapping facilitators and 200 BPN employees that conduct the adjudication process. Some computing and surveying equipment has been purchased to enable BPN to undertake land adjudication (one computer and one set of equipment per team). Further purchase will significantly increase speed of adjudication and land titling. It is targeted that up to 2009 cadastral reconstruction should successfully be completed for 600,000 land properties. Up to today, the exercising of cadastral reconstruction in all affected areas is still on progress. Various issues exist in the field encompassing technical and non technical. This is a stressful responsibility that all stakeholders are facing with. A newborn model of adjudication has been put in force due to the urgent demand to re-establish cadastral datasets of land ownerships in the affected areas. Post disaster reinforces the importance of having awareness from all stakeholders of the challenges and issues involved in exercising cadastral reconstruction. This awareness is the spirit in delivering the new model of cadastral systems to be more people oriented, in harmony with the changing nature of communities and their needs related to their land property. As a result, post disaster, a closer relationship amongst the Government, Community and Non-Government Organizations is enormously accomplished. This is the center of attention in reformatting the cadastral mind-set. It is the right time for all cadastral societies world-wide to re-design the format of current cadastral approaches. It is now an era dynamic cadastral systems that its deliveries should be more community-driven and promoted to be more focus to the people as the core stakeholder. It is hoped that the precious lessons taken from the tragedy generate new thoughts and paradigms to liven up cadastral mind-set all over the world. This would be valuable contribution to the growing world of cadastral knowledge and sciences. Haroen, T.S., Herryani, E.S., Hidayat, A.N., 2005, Cadastral Reconstruction in Aceh, Presented at the MAP ASIA 2005 Conference, Hotel Mulia Senayan, Jakarta, 22-25 Agustus 2005. Multi Donor Trust Fund for Aceh and North Sumatra. RALAS (Reconstruction of Aceh Land Administration System). Proposal for Recovery of Property Rights and Reconstruction of Land Administration System.